For the past several months I have been trying to help the students out with their study as much as I possible can. This is why I have offered Free Kyusho Meridian Charts and a Free Novice Kyusho Jitsu Certification Workbook. And today I am going to continue by offering another item. 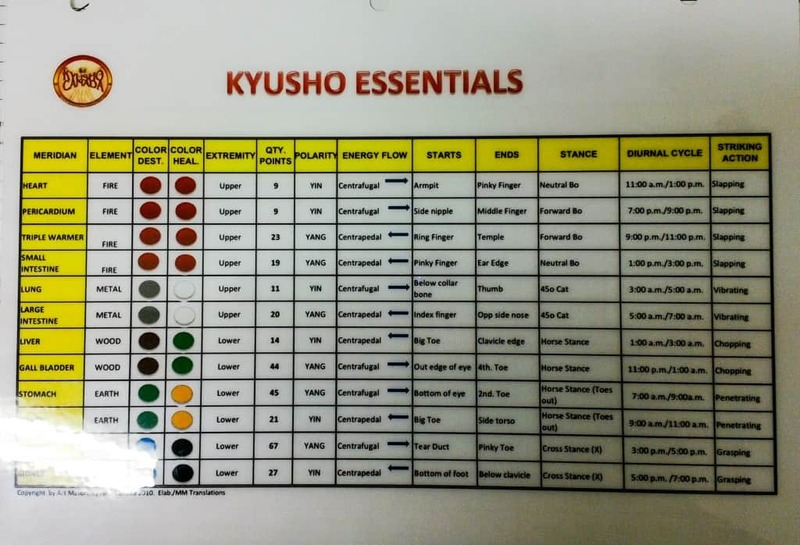 A Free Kyusho Jitsu Essentials Chart for your study. But today's offering is some very special. This is a 2 page printable PDF, and you need to print it! You print double sided on one sheet of paper. The first side being in colour, and the second side being in black and white. Then LAMINATE it! Now you have a portable reference for all the most important Kyusho Jitsu information for the first 2 years of your training. The image to the left is a BAD picture of the front of the chart. And the front of the Free Kyusho Jitsu Essentials Chart is the important part. The reason the image is bad is because i actually had someone pirate the picture and use it in a YouTube video attacking the science of pressure point self defense! I had to threaten YouTube with a lawyer to get the video deleted. What items are referenced on this chart? Here is a list for you! A total of 13 References! After you will receive and email from me with your Kyusho Jitsu Essential Chart. It is that easy! Get Your Free Kyusho Essential Chart Now! I also suggest taking a look at my NEW eBook called Kyusho Pressure Point Anatomy. This is the ultimate reference guide for all level of Kyusho Jitsu training. Follow this LINK now to learn more!